No. 42 Pine Grove is a very attractive family home which has been tastefully decorated and very well cared for. To the front there is a tarmacadam front driveway with space for up to two or more cars and there is an enclosed rear garden with decking area. The south /west facing rear garden acts as a suntrap, so the decking area gets plenty of use. The property has the advantage of having a concrete storage area built on to the gable end of the property for bikes, lawnmower etc. On entering the home, you are greeted with a very bright hallway with attractive wood flooring. To the right of the hallway is a large sitting room with wooden flooring, white wood fireplace with black marble hearth & gas fire, a beautifully wallpapered wall surrounds the fireplace and there is added advantage of a very fitting built in TV storage unit. The kitchen/dining area is situated to the rear of the property. There is tiled flooring throughout and an ample stream of walnut shaker style fitted units. There is an island feature also and this allows for additional worktop space and storage units. There is also sufficient space for kitchen table and chairs or couch/seating area. The utility room is just off the Kitchen where there is the same tiled flooring and additional units and shelving for storage. Also, plumbed for washing machine and dryer. Access to the rear garden and decking area, is just off the Utility room. Also at ground floor level is a guest w.c. and w.h.b. under the stairs in the hallway. There is carpet flooring on the stairs leading to first floor and the carpet continues to the landing area. At first floor, there are three double bedrooms, all of which have solid wood flooring and two of which have generous built in wardrobes. The master bedroom is ensuite with white bathroom suite, fully tiled and electric shower. The main bathroom is also fully tiled and with white bathroom suite and is situated to the rear of the house. There is also a walk in hotpress with additional shelving units for extra storage. Pine Grove is a very popular, established, reputable estate with large green areas and beautiful shrubbery throughout, which is excellently maintained all year round. 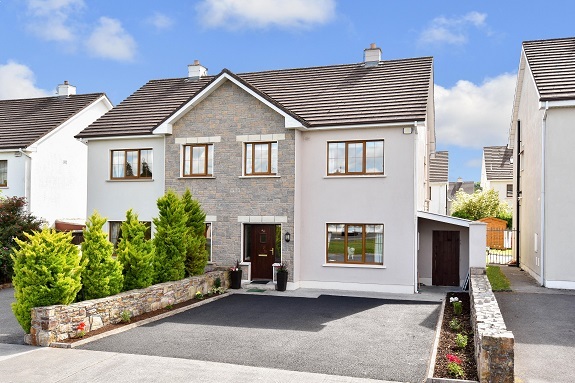 It is in a prime location within walking distance to all amenities and all that Moycullen Village has to offer. – Sitting room: large sitting room to the front of the house and overlooks large green area; white wooden fireplace, black marble hearth and gas fire, built in TV and storage unit and coving throughout. – Kitchen/Diner: with tiled flooring and tiled backsplash, shaker style kitchen units and island feature with black worktop. – Utility room: with tiled flooring, additional storage units, including long storage press and shelving. – Bedroom 1: situated to the front of the house, with solid wooden flooring and large window overlooking green area. o Ensuite: with white bathroom suite, electric shower and is fully tiled. – Bedroom 2: situated to the rear of the property, with solid wood flooring, ample fitted wardrobes and fitted five drawer unit. – Bedroom 3: situated to the front of the house, overlooking green area and with solid wooden flooring and spacious built in wardrobe. – Bathroom: large bathroom that is fully tiled and with white bathroom suite including bath, shower, wc and whb. themselves by inspection or otherwise as to the correctness of each of them. These particulars do not constitute an offer or contract or any part thereof. ← 42 Pine Grove, Moycullen, Co. Galway.